Microsoft Translator app released for Amazon Fire tablets. 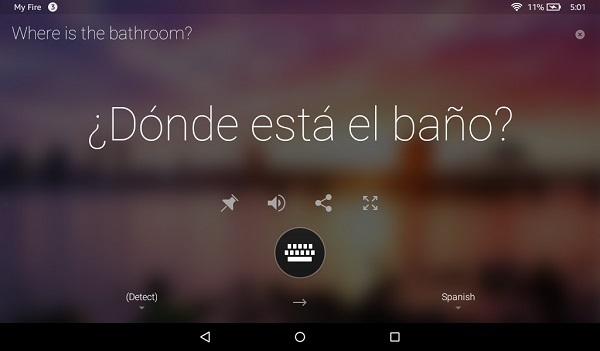 Microsoft has today made its Translator app available for Amazon's Fire tablets. Microsoft Translator has been available for translating passages of Kindle eBooks since 2012. Now, with the new Microsoft Translator app you can also use your Amazon Fire to translate the world around you. You can download the app for free from the Amazon Underground app store. Microsoft Translator translates text, pictures and even your conversations! It has a variety of features to help make your travels easier. + Before you leave, download language packs so that you'll be able to translate images and text during your trip even without an Internet connection. + Translate images like street signs, headlines and menus without typing in the text. Just quickly snap a picture directly from the app and translate it in an instant. This also works with any picture you get from email, social media, texting, etc. + If you have access to the Internet, you can use the conversation feature to engage in natural conversations with locals-ask them about their favorite restaurants, cafes, and places to see.